They tried to make me go to rehab …. 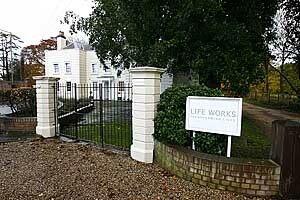 Spent all day Saturday looking for Amy ShiteHouse’s boyfriend, who is in Rehab at the Life Works Centre in Old Woking. Glorious weather, it rained pretty much none stop all day and the only photos I have to prove my endeavour is a couple of GVs. Blake Civil Fielder, or whatever his name is, is in Rehab as part of his early release conditions, he is under curfew and is tagged. I can’t forsee that he will be seen out and about in the next few weeks, I also imagine that visits by his daft bird will be limited if not actually prohibited. However that will not stop the National Papers and the Paparazzi from being camped outside for the next few weeks.